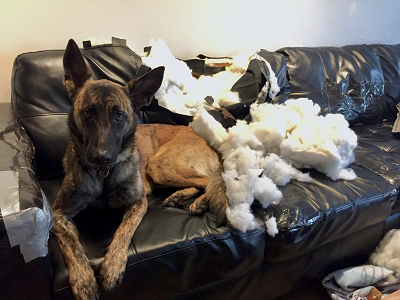 Tell us about yourself: Dutch Shepherd Owner. Since it's the 20th somewhere in the world as I write this, I am happy to announce HENDRIX IS ONE!!!!! I feel like a dork being so happy but considering he hasn't managed to kill himself or me, burn down the house, cause a car wreck, or otherwise bring apocalyptic style chaos down on us, it's time for a celebration!!! There will be video of him "opening" his present (5 milk jugs and a small box - apparently one needs to drink a whole lot more milk to fill an average box) of things he adores but isn't allowed to have often. I hope it's epic. the lack of apocalypse sounds like an excellent reason for celebration. dogs and extravagantly wrapped presents are so much fun. can't wait for the premiere of Hendrix's movie! Tell us about yourself: My name is Heather. My husband and I are empty nesters in or mid 40. We bought a 8 wk old ds from a breeder. We got the name buy a new neighbor. I bought thr dog because we both just putvthe last of or 3 dogs down. I had a dalmatian before I met my husband 4 yeats ago. The love of my life. Iove dogs that are smart and full of energy. I lve hiking but need yhe push. I am just learning alot about the new little guy, but I need more info. Okay the video won't imbed so I tried a Photobucket upload to see how it looks. I used some random movie maker on my phone that edited it for me. *edit: apparently the link went to a photo so I fixed it. Hendrix says thanks to everyone for the birthday wishes! John - thanks! Wish I could take more credit for it but it was all the app. I just shot the video and picked the theme and music. There's a few things I would have liked to edit a bit differently but that's my OCD picky side coming out lol! The app is super awesome though and I can't wait to play more with it.